Are China and Brazil transforming African agriculture? 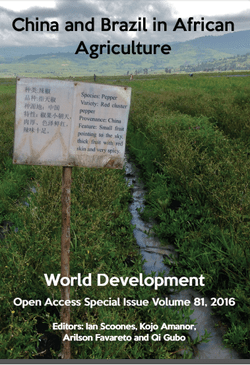 A new Open Access Special Issue in World Development based on our work on the changing role of China and Brazil in Africa’s agriculture is now available (links to individual articles are below, and also via here). The work was developed under the ‘China and Brazil in African Agriculture’ project of the Future Agricultures Consortium. The project was supported by the UK Economic and Social Research Council (grant: ES/J013420/1) under the Rising Powers and Interdependent Futures programme. The research involved studies in Ghana, Ethiopia, Mozambique and Zimbabwe, as well as China and Brazil. There were over 20 research collaborators involved, from Africa, China, Brazil and Europe, and it was a massively rich, if sometimes challenging, experience. Our research looked at 16 different case studies, involving a mix of agricultural investments by private and state owned enterprises, tri-lateral development cooperation efforts, technology demonstration initiatives, training programmes, as well as ‘under-the-radar’ involvement in agriculture by Chinese migrants. There was no single story emerging, but a complex set of engagements, which contrast in important ways with existing patterns of western-led development and investment, and offer important opportunities for reflection and learning. These 8 papers (along with over 20 other Working Papers on the project website) are the result. Do download, read and send us feedback! It’s been a lot of work putting them together!